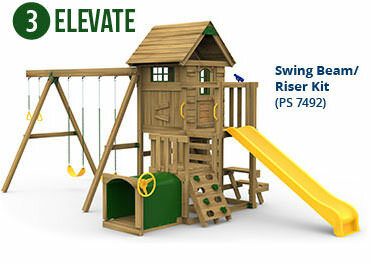 The Build It Yourself line of affordable outdoor wood swing set kits from PlayStar are the easiest & fastest to build! 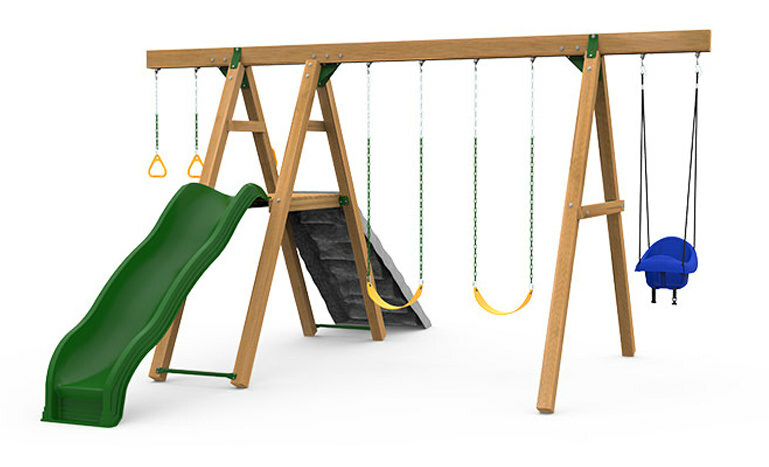 Each swing set is available in multiple design options: Gold, Silver, Bronze and Starter. 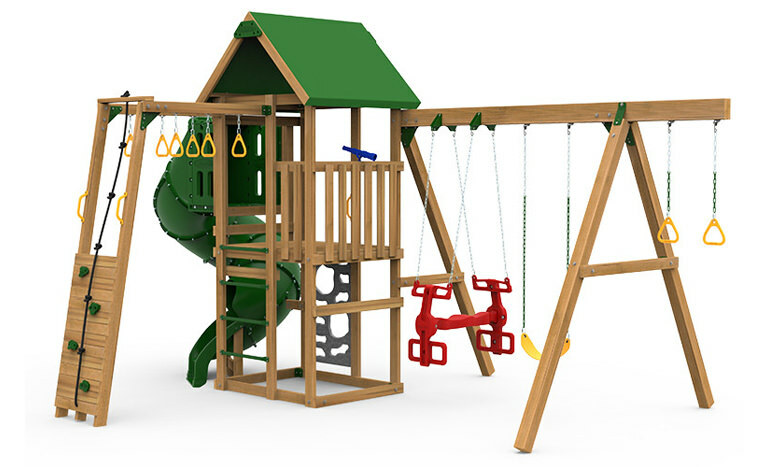 All Build It Yourself kits include hardware, patented brackets, swings, chain, components, and plans. 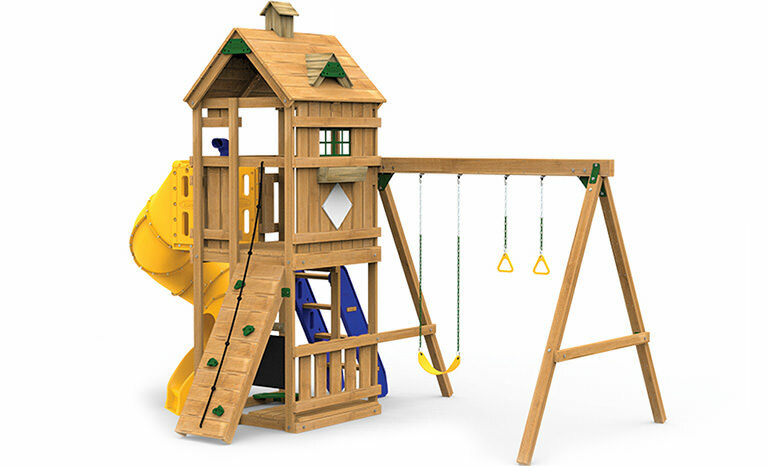 Our Design Options allow you to customize your playset and select from a variety of tower sizes and activities. These are specific to the Design Option you chose. Our simple, no angle cuts allow you to do it yourself and Save Money. 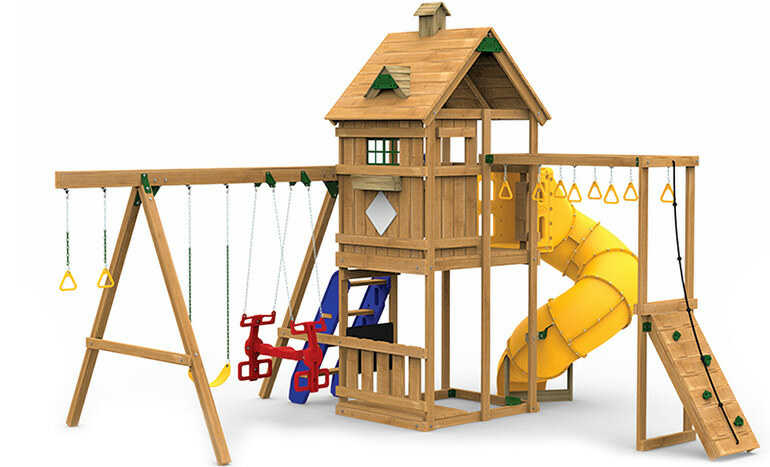 Our Design Options allow you to customize your playset and select from a variety of tower sizes and activities to meet your family's needs. These are specific to the Design Option you chose, put the finishing touches on your playset and are separate from any of the RTA cartons. 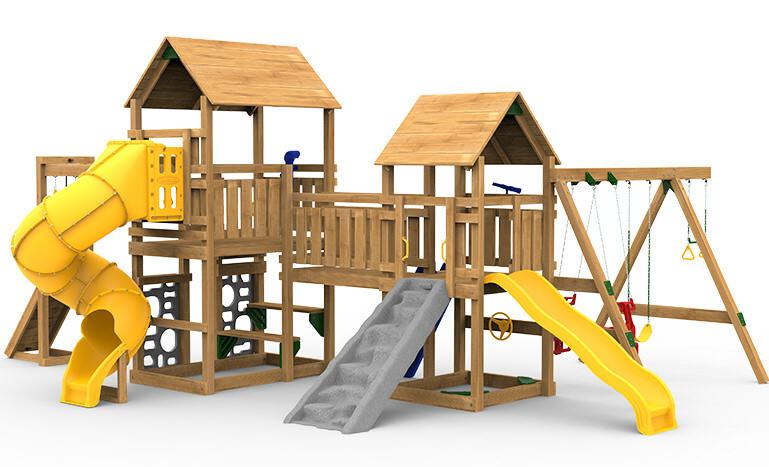 Any of the play sets on our website are available Factory Built. 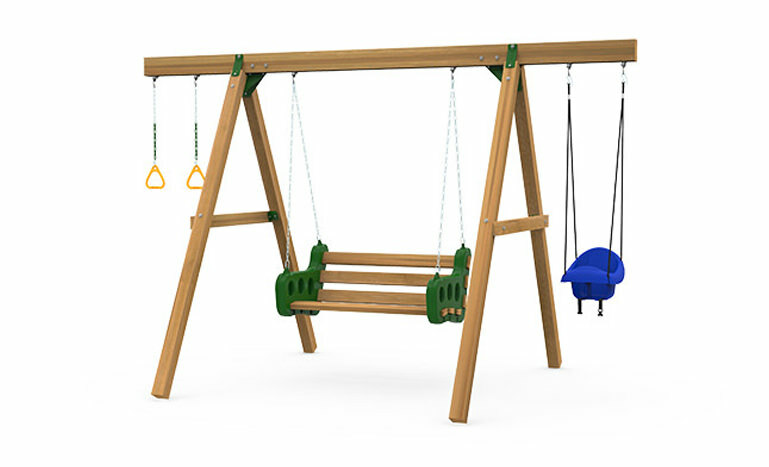 Direct from our factory to your backyard our Factory Built wooden swing sets are completely stained and will set up in just a few hours. 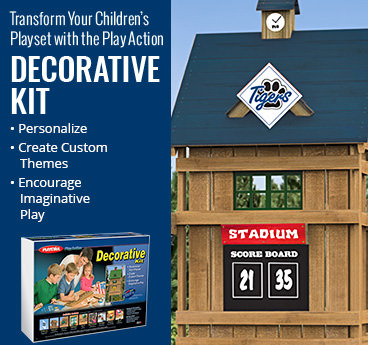 You Are Ready for Play!!! 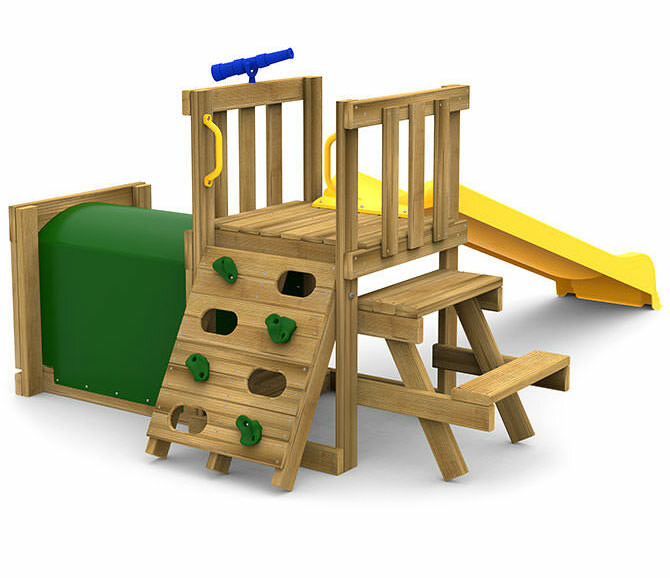 The Factory Built wooden play sets are custom built specifically for you. 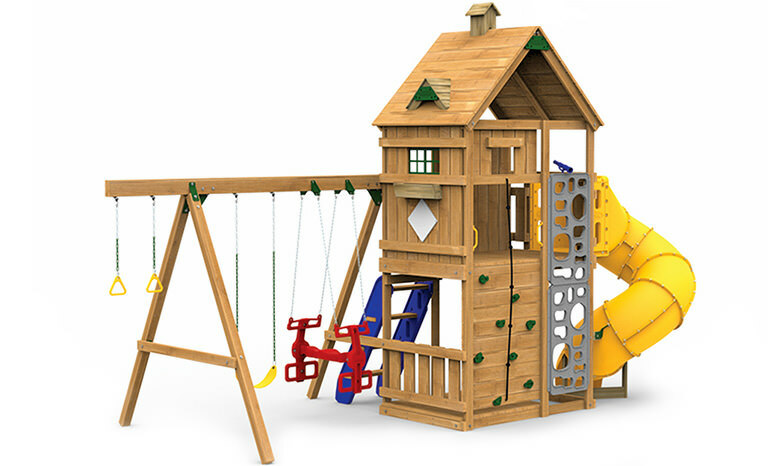 If ordered on-line your playset will be shipped via a flatbed truck with a fork lift. The freight is "curbside" delivery by contracted carriers. 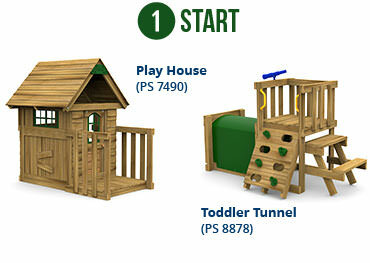 If purchased directly from your local retailer your Factory Built playset will ship to that location. PlayStar’s Premium Dock system incorporates leading edge technology to provide you with maximum performance. Each 4’ x 10’ section weighs less than 170 pounds and is made with a heavy-duty aluminum frame and protective resin side walls. Ready to Assemble and conveniently packaged you can have the ULTIMATE DOCK in just one weekend. PlayStar’s Premium Dock can be installed as Stationary, Roll-In or Floating and offers a Lifetime Warranty! The PlayStar Aluminum Dock is made from a strong tempered alloy and features a 12” on center C-channel frame support. 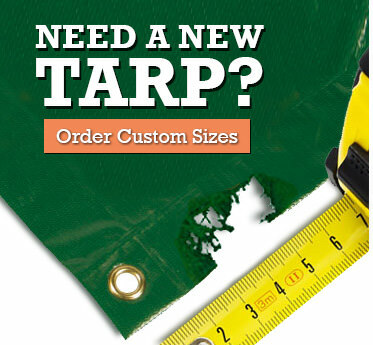 Each 4’ x 10’ section is Lightweight and Easy to Maintain. This Ready to Assemble dock allows you to Grab & Go when combined with PlayStar’s Resin Dock Top. 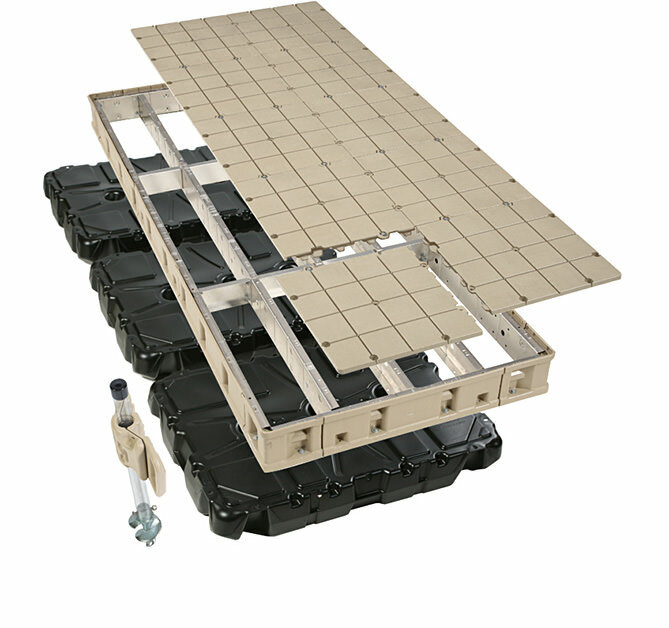 PlayStar’s Aluminum Dock can be installed as a Stationary, Roll-In or Floating Dock and has a 15 Year Warranty! 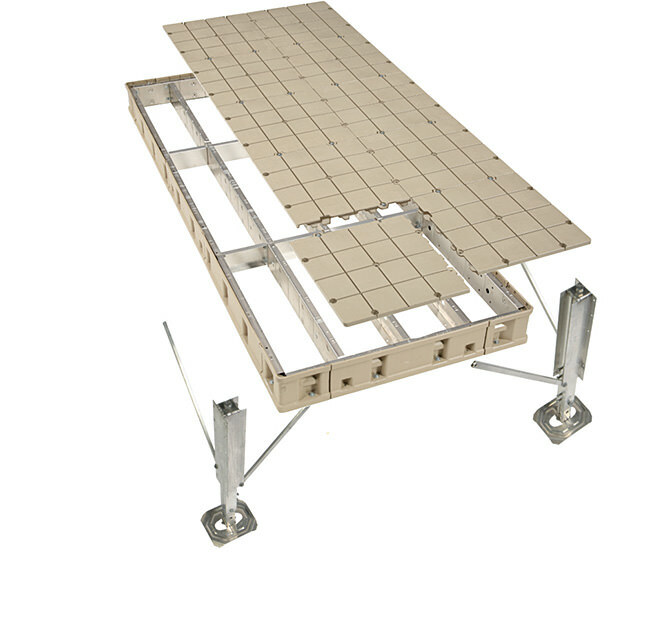 The PlayStar Commercial Grade 4' x 10' Frame is made with Hot-Dipped Galvanized - Heavy-Duty Steel Components that when combined with 2” x 6” lumber, constructs the best Build It Yourself dock available. A great solution for rugged lakeshores and swift running rivers, this dock is designed for heavy use. 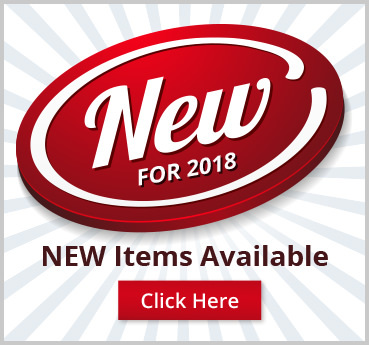 Multiple Dock top options are available. PlayStar’s Commercial Grade Dock can be Installed as a Stationary, Roll-In or Floating Dock and provides a 25 Year Warranty! 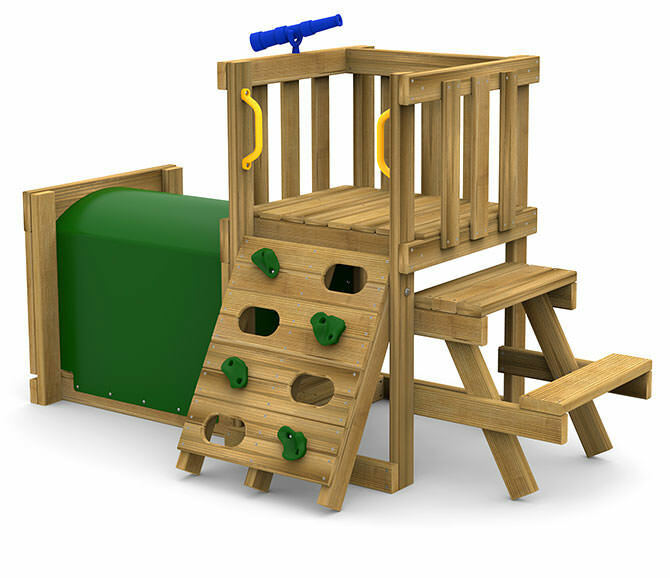 The PlayStar Standard Dock is a 4' x 6' wood frame Dock made with Powder Coated Brackets. 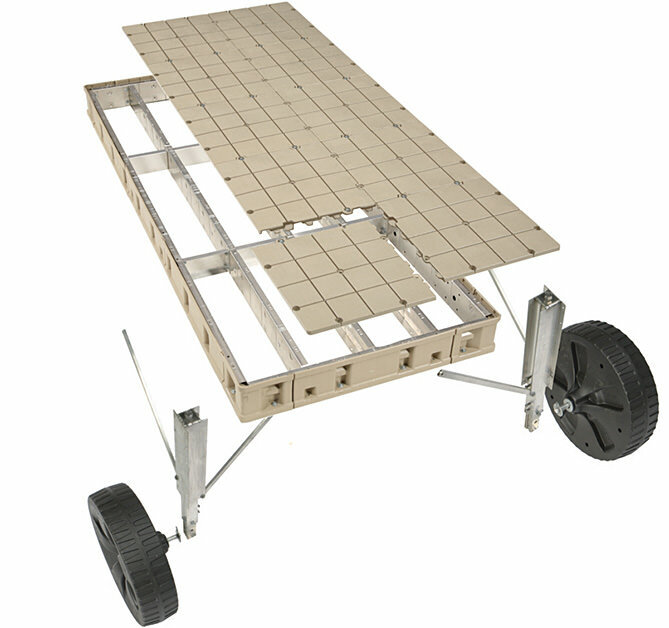 This economical dock can be built as a Roll In or Stationary and comes with a 2 Year Warranty. Designed for active toddlers to help build strength and develop coordination the Toddler Tunnel is well rounded fun for little children. 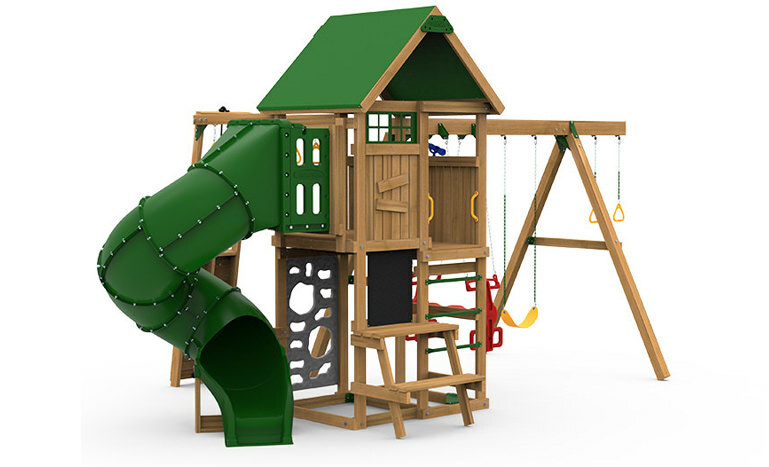 Includes an Adventure Tunnel, play deck, picnic table, rock wall, play handles, telescope, anchors and location for a slide (sold separately). 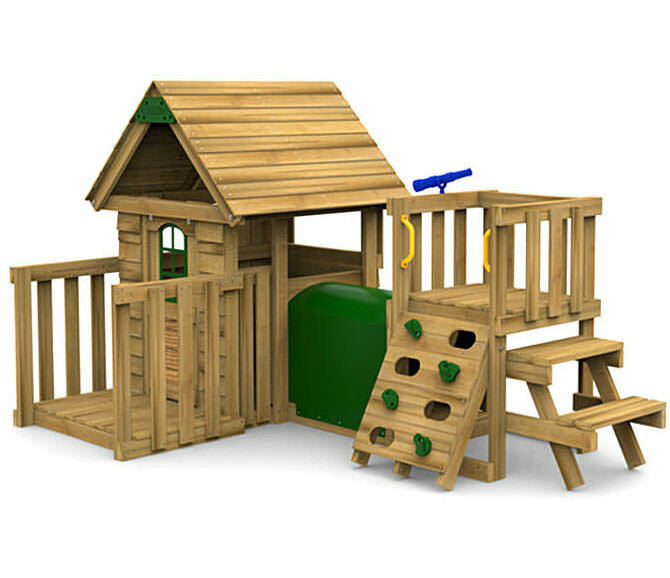 When it's time to expand, simply attach the Little Sprout Playhouse PS 7490. 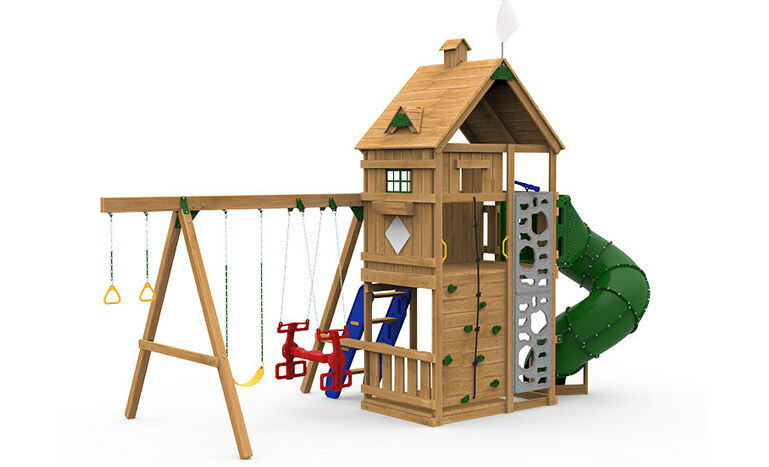 The Little Sprout Swing Beam/Riser kit allows you to easily elevate the Little Sprout Play House PS 7490 and create a complete swing set without removing a single screw or board. 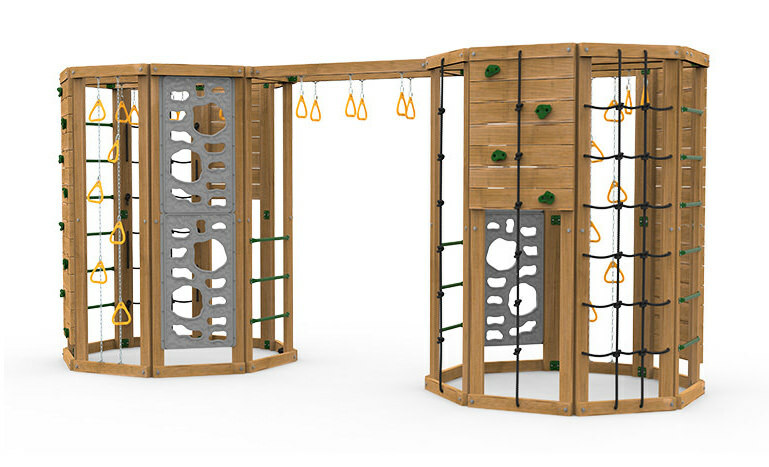 Includes wood posts & swing beam, brackets, 3 sets of swing hangers, 2 swings with chain, 2 gym rings with chain along with rock wall, rope, play handles, posts and all hardware with fully illustrated plans. Attach the Toddler Tunnel PS 8878 for more activities and unique play deck access. 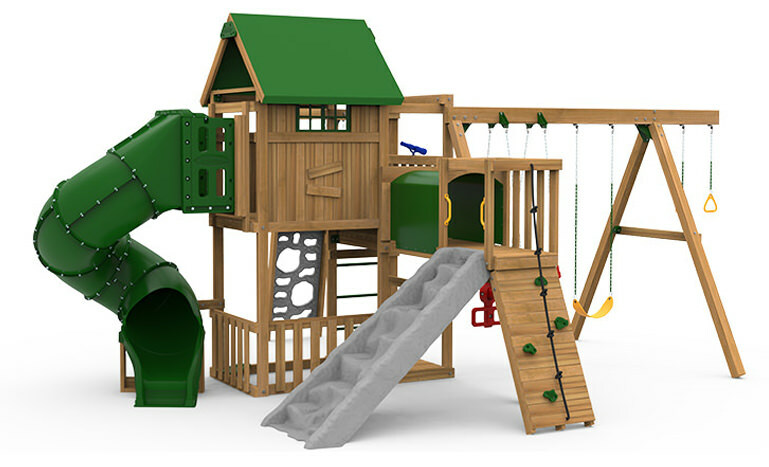 Our Little Sprout playsets Grow with your Child! 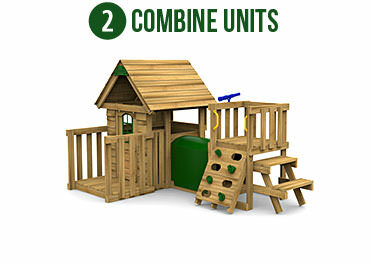 They are Easily Expanded and a fantastic solution for families with young children. They provide age appropriate activities and allow you to make an investment in your child’s future over a period of time. Just sit back, relax, and Watch them Grow! Some of the fine retailers where you will find PlayStar products!